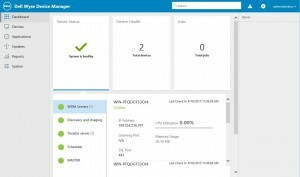 Today Dell has released the new version of their management solution called Wyse Device Manager (WDM). This version is the first step to a complete new look of WDM. Dell has included a new webinterface as a preview. But there are a lot more feature that came into this build version. Most interesting is the new option to push configurations to Linux via WCM (Wyse Configuration Manager). I am really curious about the next release when hopefully all the preview and limited features are finalized. Dell Wyse Configuration Manager (WCM) for SUSE Linux can now be launched from WDM and you can create and apply configuration files to thin client devices running SUSE Linux operating systems. This feature requires a separate add-on. Profile Manager enables you to deploy a predefined configuration on a specified group of devices. These configurations are those that you create using WCM and save them in a specified repository. Now you can access your devices via supported browsers with the new, sleek WDM Web UI. Note: Current version of Web UI is view only. Next MR will have major workflows working in Web UI. 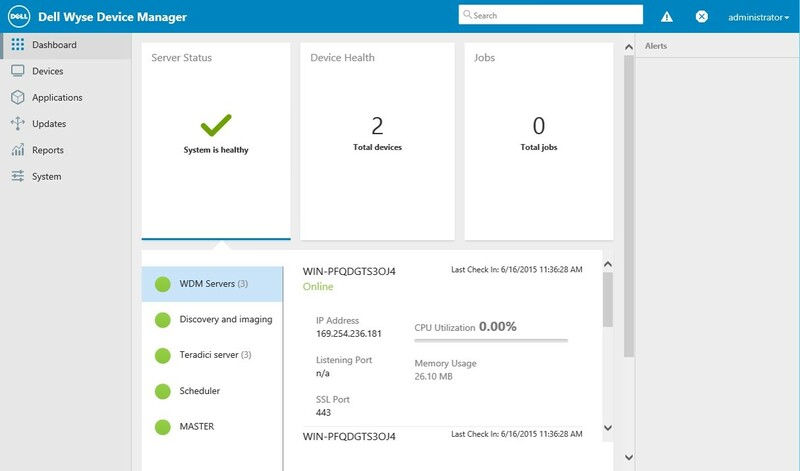 WDM 5.5 supports all of your Wyse Windows 10 IoT Enterprise thin client devices. WCM supports Windows 10 IoT thin clients with limited functionality. WDM 5.5 supports imaging of devices with hard drive capacities over 60GB. In the WDM GUI you can find the Legacy platform name mapping in the Hardware info asset information tab. If the devices discovered or added manually are more than the available licenses available in the WDM server then the devices will be listed in the Unmanaged Devices section. WDM 5.5 supports the Wyse thin client rebranded model names. In the WDM GUI you can find the legacy platform name mapping in the Hardware info asset information tab. Dell has announced enhancements for Windows Embedded 8 thin clients. The new Maintenance Release 1 includes the latest client protocols from Citrix, VMware, and vWorkspace, security patches, and driver updates. The Wyse ThinOS 8.2 MR release, scheduled for Q2 CY2016 will be the final firmware release, at which point no further engineering activities are planned for these devices. Basic hardware and software support will still be provided for these products to any customers with outstanding service contracts. However, no additional service contracts or maintenance support contracts will be sold to these EOL products. On July 13th Dell announced the next version of vWorkspace 8.6 at the Microsoft WPC. This version will be available end of this month. Added Unicode support for vWorkspace core products such as the Connection Broker and Web Access as well as the connectors. Localized connectors for Chinese, Japanese, Korean. Integrate virtual layers into a vWorkspace virtual desktop to separate departmental applications from the virtual desktop’s operating system. Captures user profile data in a layer that can be accessed from any device. Allows client streamed by WSM to seamlessly switch to a different WSM server in the event of failure. Provides single management UI for all WSM Sites. This direct integration with Windows Server Hyper-V adds support for provisioning of full, persistent virtual machines where previous versions of vWorkspace HyperDeploy only supported differencing disk clones. When using a Hyper-V cluster as the compute engine for your vWorkspace virtual desktops you have the option to set the virtual machines to be available across the cluster (High Availability). This connector for ChromeOS provides a more native user experience than HTML5 and shall be available via the Google Chrome Web Store. Complete streamline of the vWorkspace Connectors’ user interface to improve end user ease of use. Only thing user needs to know to obtain a configuration is their email and password. Allows authorized users to drag files and content from their Windows PC and drop them into vWorkspace desktops and applications. This simplifies common workflows. For example; insurance agents can now drag files directly into the correct claim record of their hosted CRM application. This functionality is not available in the Windows native Remote Desktop Connection. Dell just announced the launch of two new units. Starting July 29th Dell has Windows 10 IoT Enterprise units in their portfolio. The units are based on the well-known D90Q and Z90Q hardware. This means they will come with a quad core processor (1.5 GHz and 2.0 GHz), 32GB of MLC flash and optional wireless support. The first release will only include RDP10 and Citrix Receiver. VMware View, Ericom emulation and even Dell’s own Wyse vWorkspace clients will be missing in this release as they are not Windows 10 ready at the moment. There is an update planed for later this year. They will be called Wyse 7490-Z90Q10 and 5490-D90Q10. Looks like we have finally finished the move of the old technicalhelp.de/freewysemonkeys.com site to this new CMS system. I really hope you like the new design and find it easier to use. I was able to migrate all user accounts but the passwords are lost. Please use the “Forget Password” function to reset yours and get a new one. Sorry for that.